A world class business school. A machine shop. A mountain village in Guatemala. A centuries-old trail in southern France and northern Spain. These aren’t typical places where a man is formed for the priesthood. 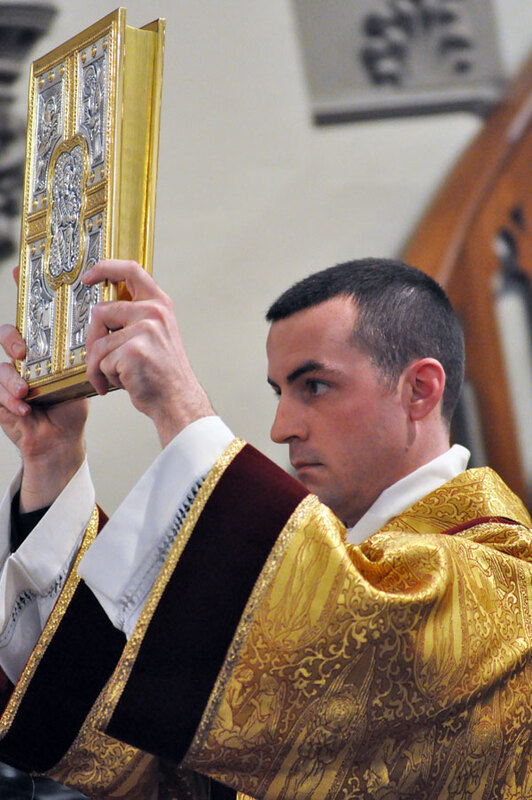 But the time that transitional Deacon Dustin Boehm spent in each of them—along with his experience in the usual seminaries, parishes, hospitals and schools—prepared him over the course of many years for the life and ministry of a priest. In these many and varied locales, Deacon Boehm learned lessons about humility and goodness that his friends and family say will serve him well as a priest of the Archdiocese of Indianapolis. His ordination Mass will take place at 10 a.m. on June 4 at SS. Peter and Paul Cathedral, 1347 N. Meridian St., in Indianapolis. The public is welcome to attend. The son of Kenny and Kelli Boehm, Deacon Boehm, 27, grew up as a member of Our Lady of the Greenwood Parish in Greenwood. He first began thinking about being a priest when, as a middle school student at his parish’s school, he overheard his music teacher, Jon Thibo, say that he had discerned a possible priestly vocation. Kenny Boehm was happy to hear about his young son’s interest in the priesthood. But around that same time, Kenny wanted to make sure that his son had firsthand experience of a different way of life. Throughout high school, though, the thought of being a priest wouldn’t leave Deacon Boehm. In his senior year at Roncalli High School in Indianapolis, he applied to become a seminarian for the archdiocese. Yet even after his freshman year at St. John Vianney College Seminary in St. Paul, Minn., Deacon Boehm and some friends ran a summertime fence-building business. Ben Kessler, one of his seminary friends, said that the interest in and the value that Deacon Boehm has for the work that people do in the secular world are good qualities for a priest. “He has made an effort to keep in touch with the world outside of seminary and, most importantly, with the people he’s serving,” said Kessler, previously a seminarian for the Diocese of Madison, Wis., and now a student at the Stanford Graduate School of Business in Stanford, Calif.
Last December, Deacon Boehm made a trip to Boston to visit Kessler and his fiancé, a student at Harvard University’s Business School. Deacon Boehm was set to serve others in late 2008 when he traveled to San Lucas Toliman, a village in the mountains of southern Guatemala. He thought that he was going there to work hard, and make a real difference in the lives of the people in that poverty-stricken area. He soon learned, however, that God had something else in mind for him—a lesson in humility. While he still worked hard with the villagers, his reason for being there became more spiritual in nature. Deacon Boehm’s mission trip to Guatemala happened during the time that he took a spiritual year from his priestly formation at Saint Meinrad Seminary and School of Theology in St. Meinrad. That same year, he made an 850-mile pilgrimage on foot to the famous medieval shrine of Santiago de Compostela in northern Spain. When he returned to the U.S. in the late spring of 2009, Deacon Boehm’s younger brother, Adam, and his wife, Maria, were caring for their baby daughter, Isabella. Less than a year later, Maria gave birth to a son, Killian. And they are now awaiting the birth of their third child in October. Deacon Boehm has made regular visits to see his brother and his family at their home in Lexington, Ky., visits that he said help him value the blessings and challenges of family life. “Those kids mean the world to me,” said Deacon Boehm of his niece and nephew. “And I’ve been so blessed these last few years in being allowed to be there whenever I want to watch that young family and just see the struggles, certainly not from the inside of that family, but from a pretty close seat. From Adam’s perspective, his brother has already been doing this. It was his help and his example, Adam said, that led him to give of himself as much as he has in his life as a husband and father. Deacon Boehm’s valuing of family life is also rooted in the example of his parents, who “sacrificed their own dreams, their own time [and] their patience in raising me. When she sees how much her son values family life and how much he has grown through his years of priestly formation, Kelli Boehm feels humbled and knows that she can’t take credit for what has happened to Deacon Boehm. Deacon Boehm will celebrate a Mass of Thanksgiving at 5:30 p.m. on June 4 at Our Lady of the Greenwood Church, 335 S. Meridian St., in Greenwood. “I can’t wait for that moment,” he said. “For so long, it’s been at the hands of these hardworking [priests], and these people in the pews who have also been present and made the presence of Christ so visible in my life. In July, he will begin his ministry as associate pastor of St. Monica Parish in Indianapolis. Father Peter Marshall, associate pastor of St. Pius X Parish in Indianapolis, is a friend of Deacon Boehm who was ordained two years ago. He is looking forward to welcoming him into the archdiocese’s presbyterate. Favorite Bible verse: “I know well the plans I have in mind for you, says the Lord, plans for your welfare, not for woe! plans to give you a future full of hope” (Jer 29:11).